Convicted Alaska lawmaker Pete Kott has decided to appeal his corruption convictions and his December 7th sentence. 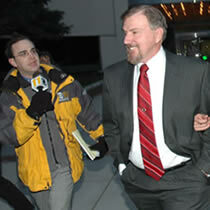 The Associated Press reports that the appeal could take up to 18 months for the 9th Circuit Court to hear Kott's case. The AP also says that Kott's attorney will file a motion with the court to keep Kott out of prison until the 9th Circuit rules on his appeal. Kott, Alaska's former speaker of the House, was sentenced to six years in federal prison for his convictions on bribery, conspiracy, and extortion charges in September. Kott was also ordered to pay a $10,000 fine, ordered to receive alcoholism treatment, and was given three years' probation. U.S. District Judge John Sedwick told the court that he found that Kott had committed perjury in his testimony during his September 25th trial and gave him a stiffer sentence for it. "What we saw here and what the jury convicted Mr. Kott of - was an unusual and extraordinary, outrageous, egregious pattern of self-serving conduct." "Having listened to that testimony, I am utterly convinced that at the trial, with respect to this payment, Mr. Kott gave false testimony under oath." "...all my actions that I took while a member of the Legislature on the House floor, I took and truly felt that I did so in the best interests for the citizens of Alaska and the state of Alaska"